To varying degrees, I have learned Greek, Latin, German, French, and English, but dogish lies out of my reach. My grandmother spoke to her dog, but the snuffly little pug's responses never sounded anything like what my grandmother said to him. She said things like, "I do before to be a hudra hud," which meant "good dog." To request a photograph of the dog one would ask if it minded having its "wotytook." As a boy, I was sure it was a real language, but it wasn't - twas fun, but not dogish. Prairie-dog communication is so complex, Slobodchikoff says — so expressive and rich in information — that it constitutes nothing less than language. So, what? Dogs talk? Apparently it's possible. The same might be true of whales and perhaps even the meow the cat makes could be translated into the English sentence, "get off my chair, humanoid!" The ramifications are far reaching. If animals are able to communicate using language, then what separates us from them? Sure, we are human and a little more advanced, but there is nothing unique about us: "To concede that we share language with other species is to finally and fully admit that we are different from other animals only in degrees not in kind." Descartes, for one, would turn in his grave. For Descartes, animals can't even think let alone talk. Our thinking has evolved since then and we are privy to an immense body of research produced in the last thirty years or so all of which purports to give evidence that animals are more than mere input-output systems. Some of the claims, like the one Slobodchikoff makes, are quite extreme, but most of them merely suggest a sliding scale of thought capacity analogous to the capacity we find in humans. 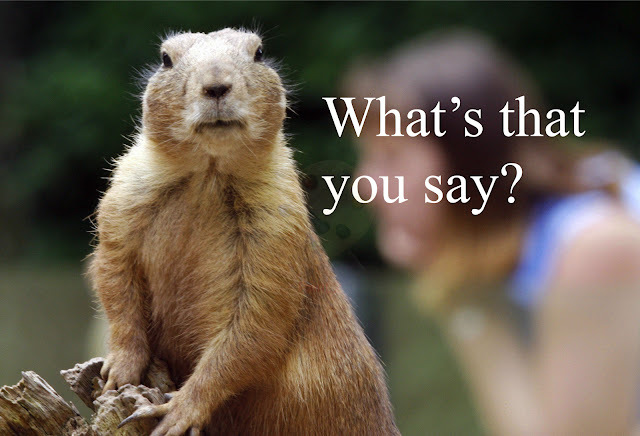 The problem with Slobodchikoff's claim--that prairie dogs have a language--is that languages involve all sorts of things beyond communication. For example, communication does not entail any attitudes towards propositions. Computers can communicate data, but they don't believe any of it. To believe something is to have a concept of belief and to have one of those, one must have the concept of truth and falsity. Computers don't disagree with one another (unless one is speaking metaphorically). While it is not impossible that dogs have beliefs--it is certainly conceivable--it is not clear we can derive that conclusion given the evidence Slobodchikoff and friends present to us. Whereas the tone of human speech is typically determined by a fundamental frequency and just three or four overtones layered on top, prairie dogs can have six or seven audible overtones mingling in a single call. Slobodchikoff thinks that by modifying these harmonics and combining them in different ways, prairie dogs form original descriptive phrases: dog big yellow fast; human small blue slow. This data appears to raise the bar from the more classic conclusion that animals make different sounds depending on the kind of predator they see and that other potential prey from the same species react in predictable ways in response to those sounds. Prairie dogs do all that, but they also appear to distinguish the color and size of their predators. Slobodchikoff suggests that colors and size require different evasive actions and so the animals have adopted a range of sounds that pick out these features in their predators. Someone who wants to dismiss the claim that animals speak language will generally reply that the making of distinguishable sounds in response to the presence of different kinds of prey does not a reference make. In other words, the data doesn't tell us that animals refer to objects nor that those who hear the sound form a belief that the thing referred to is present and then infer that the best course of action is to hide under a bush or up a tree depending on the kind of predator referred to. A simpler explanation for the cognitive animal skeptic is that sounds of predators cause responses much like sounds of prey. There is simply no need to ascribe complex beliefs to animals. A further objection from the Chomskian tradition is to say that nothing knows a language unless they know syntax. What Slobodchikoff provides is evidence that prairie dogs might know some words, but this does not constitute a language. To many biologists and neuroscientists, however, this notion smacks of anthropocentrism. There is now a consensus that numerous species, including birds and mammals, as well as octopuses and honeybees, have some degree of consciousness, that is, a subjective experience of the world — they feel, think, remember, plan and in some cases possess a sense of self. In parallel, although few scientists are as ready as Slobodchikoff to proclaim the existence of nonhuman language, the idea that many species have language-like abilities, that animal communication is vastly more sophisticated than [opponents have] realized, is gaining credence. I was listening to philosopher, Tim Crane, talk about this and he thinks that the area is in need of some philosophical assistance. I agree. For one thing, if we ascribe conscious thought to an animal we ought to be clear about what we mean by thought. There is a difference between thinking as a process of cognition whereby an animal perceives a threat, issues a warning cry, and then ducks behind a hedge, and the kind of thought that entails beliefs, the entertaining of counterfactual statements, and theory construction. All of those activities imply the presence of a highly complex conceptual scheme present in the minds of animals. Even the simplest of beliefs require vast conceptual resources. For example, consider the following belief ascribed to a prairie dog: "that coyote is big and hungry. If I hide under this bush, he might not get me." First, consider the idea of predication - saying the coyote is big entails knowing how to predicate a property of something; one has to know what it is for something to belong to some class of things that share a common feature, in this case, bigness. Second, consider any noun. In order to have a belief that the coyote is big, one must have a concept of size, of some things being bigger than other things. Finally, the latter belief is about something that may or may not happen. This would entail having a concept of possibility. All this seems a bit much to ascribe to a prairie dog. The lesson from all this is that to ascribe to animals the ability to interact with their environment as the prairie dog does one does not have to ascribe any conceptual content to their thoughts. If, however, one claims that they can speak a language, then an incredible conceptual scheme must be there. Another interesting problem is the problem of other minds - how we know there are any. In discerning their presence in humans we have enormous difficulty. It is possible to construct an inductive argument for them, but this is short on its ability to convince a skeptic. There being one mind--the one I have personal access to--is plain enough, but no amount of behavior we perceive in others provides the kind of evidence we're looking for. It is better to think of beliefs in other minds as basic, beliefs we can't help forming and suffer from no defeaters (see God and Other Minds by Alvin Plantinga). But what makes us think there are minds in animals? If an argument for their mindedness runs along the same inductive lines as we have attempted for our own species it will surely fall shorter than we would like. But believing in the mindedness of animals is far from a basic belief, we can certainly help forming beliefs about minds in other animals. Language use in animals would be convincing if we had good reason to think those communicative sounds are actually a language and I'm not sure we're close to that conclusion.